"Nobody guesses that green tomatoes are in this very tasty jam. It freezes well, cans easily, and the preparation is very quick." Combine tomatoes and sugar in a large saucepan and bring to a boil over medium heat. Stir and cook about 10 minutes. Add the gelatin, reduce heat to low, and simmer for 20 minutes. Spoon into hot, sterilized jars and seal; or, pour into freezer containers and freeze. Sorry, but I found this to be a poor substitute for raspberry jam. It had kind of a raspberry flavor, but just not like the real thing. This is a great recipe. 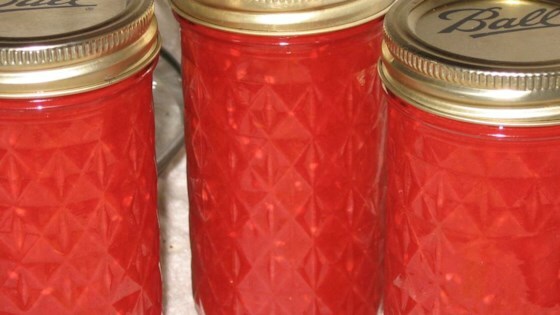 You can use Strawberry gelatin instead of Raspberry gelatin for a different taste, if you have a lot of green tomatoes left in the garden in the fall. Made a half batch, which filled 4 half-pint jars. Processed in a water bath for about 10 minutes to seal. Super way to use up all those green tomatoes and what a taste, better than store bought.